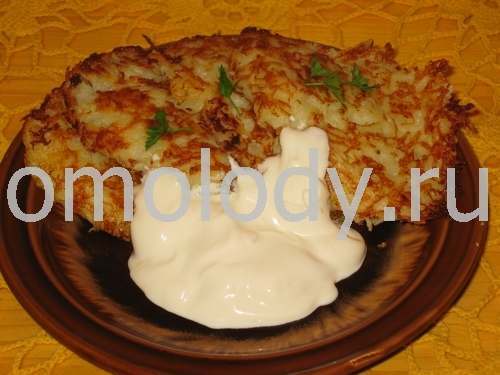 Potato Pancakes. Recipes from Russia. 2 lb fresh peeled, uncooked, finely grated potatoes. 1. Peel fresh potatoes and grate finely, squeeze out the juice and add boiled hot milk, instead the juice to prevent them going brown. Stir, cool the mixture. 2. Combine with salt and eggs. Heat frying-pan with a long handle, rub with oil, pour 4 - 5 little rounds of potato mixture on the pan. 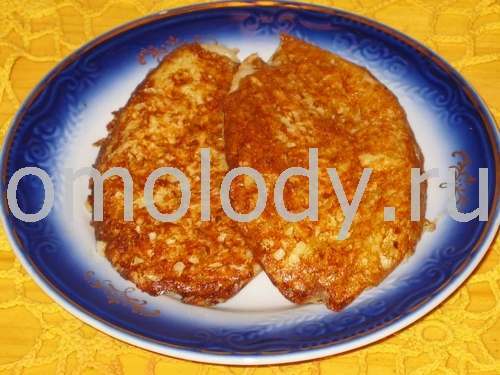 When one side is cooked, turn the pancakes over and cook the other side. Continue with this process until all of the potato mixture has been made into pancakes. Serve hot, with cream, butter, or sour cream.